In August 2015 The Volvo Car Clubs of Australia held their National Rally and Pelle Petterson was invited to attend. Unfortunately he had been unwell and was advised not to fly to Australia. Gerry Lister caught up with him in June at the Volvo Museum in Goteborg Sweden and with the help of Margarita Lister, produced a video interview for the Rally dinner being held on Sunday August 16. 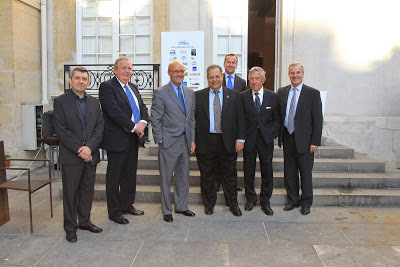 June 8, 2010 he received from H.M the King Carl XVI Gustaf of Sweden the King's Medal (12th size bright-blue ribbon) for outstanding contributions as a yachtsman and boat designer. The Magic with Pelle Petterson lays not only in his incredible talent in designing the P1800 in the workshop of Maserati's and combining fins and details that made its fame, but also with the fact his name as designer of the P1800 was kept secret during more than 50years, since the brand officially recognized only his paternity of the coupé with the voice of wise Claes in 2009. A white 1962 Volvo P1800 (with license plate ST1) driven by Simon Templar, played by Roger Moore, was featured in the TV series The Saint beginning in 1962 and played a prominent role throughout the entire run of the show. Roger Moore was so smitten with the Volvo P1800 that he bought one for his own personal use. When asked to name his favorite "movie cars", Moore stated it was the Volvo P1800, commenting: "I have a great affection for the Volvo P1800, as, of course, I owned one, as well as used one in the series. It’s a beautiful car and I still drive a Volvo to this day." 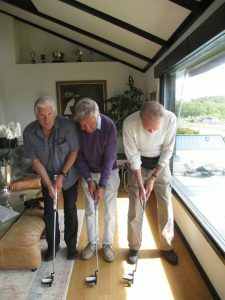 Pelle was kind enough to invite us to his Swedish home which has a wonderful view of the ocean. 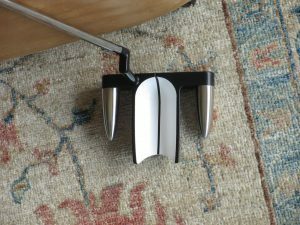 He told us he cannot stop designing and his latest venture is a putter with a unique design. 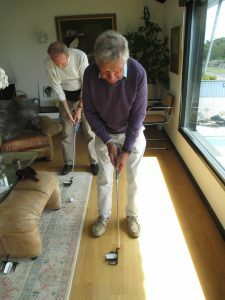 Gerry Lister & Kevin Elliott practiced their putting in Pelle Peterson’s lounge room, using his new invention – a putter that looks a bit like the back of a Volvo P1800.